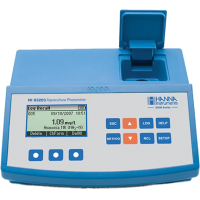 The HI83203-02, one can determine 13 parameters : ammonia MR, LR ammonia, free chlorine, total chlorine, copper HR, LR copper , nitrate, nitrite, HR, LR nitrite, dissolved oxygen (DO), pH, phosphate HR and LR phosphate. 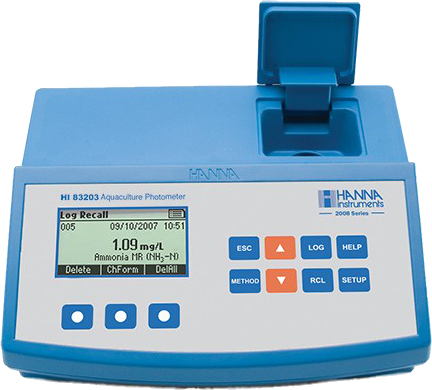 Determination of your quality water is no problem for the HI83203-02. With the ever increasing depletion of fish stocks in the open seas, aquaculture has gained prominence and can prove essential to our future dietary needs. Monitoring and controlling parameters such as the oxygen level as well as pH and nitrate content in water is vital in ensuring profitable fish production. Accurate control can prevent disease, increase production and even reduce the premiums on crop insurance. Research personnel, fish farm operators and wildlife specialists now have one compact and easy to use meter to keep a close tab on the most important parameters in aquaculture. 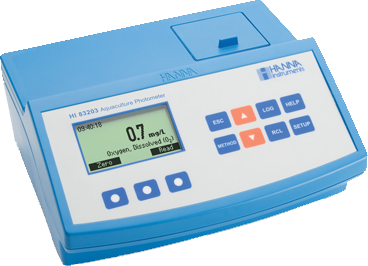 HI 83203 is a multiparameter bench meter that measures thirteen methods essential for aquaculture analysis. 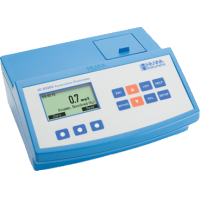 It has four channels allowing for a wide range of tests. The optical system of HI 83203 is based on special subminiature tungsten lamps and narrow-band interference filters to guarantee both high performance and reliable results. HI 83203 has a powerful interactive user support that assists the user during the analysis process. A full tutorial is available in the Setup Menu, and the Help Menu provides assistance for every step in the measurement process.This meter can be connected to a PC via a USB cable, where the data can be managed with optional HI 92000 Windows® compatible software.